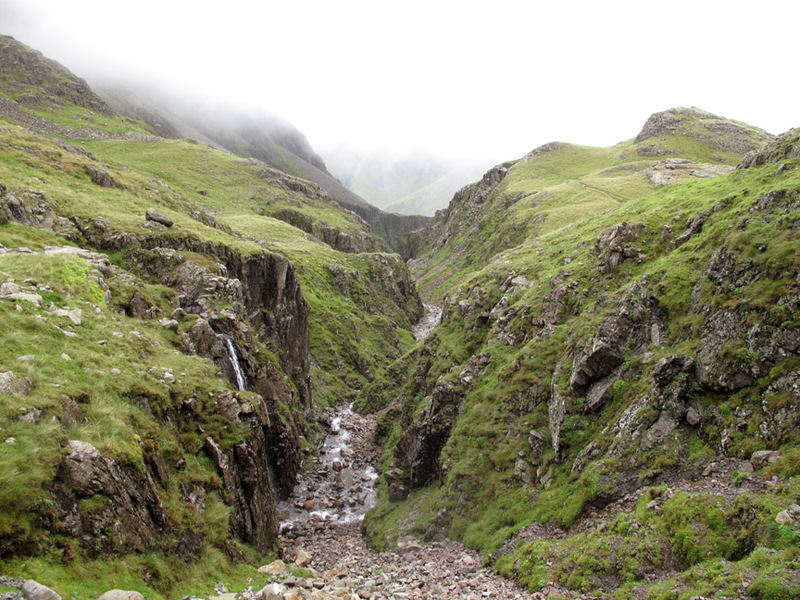 " Lingmell and Piers Gill "
Date & start time: Thursday 23rd August 2012, 11.40 am start. 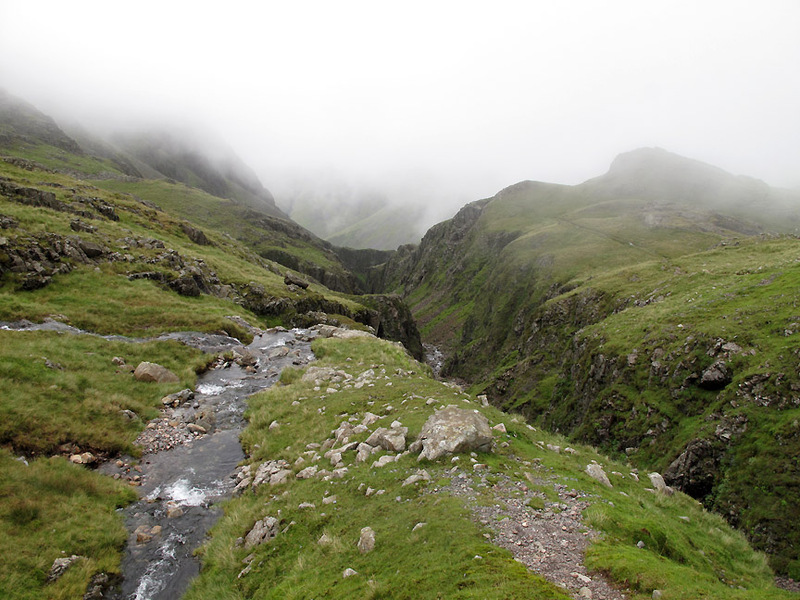 Places visited : Lingmell Beck (lower valley track), Piers Gill, Lingmell, then back down the nose. 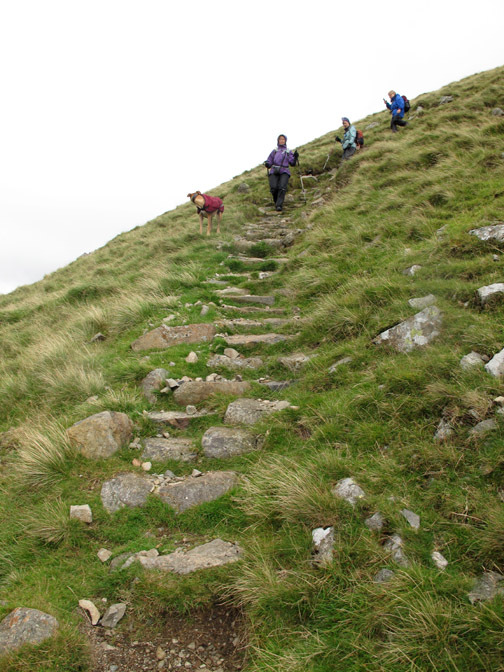 Walk details : 6.7 mls, 2515 ft of ascent, 6 hours 23 mins. 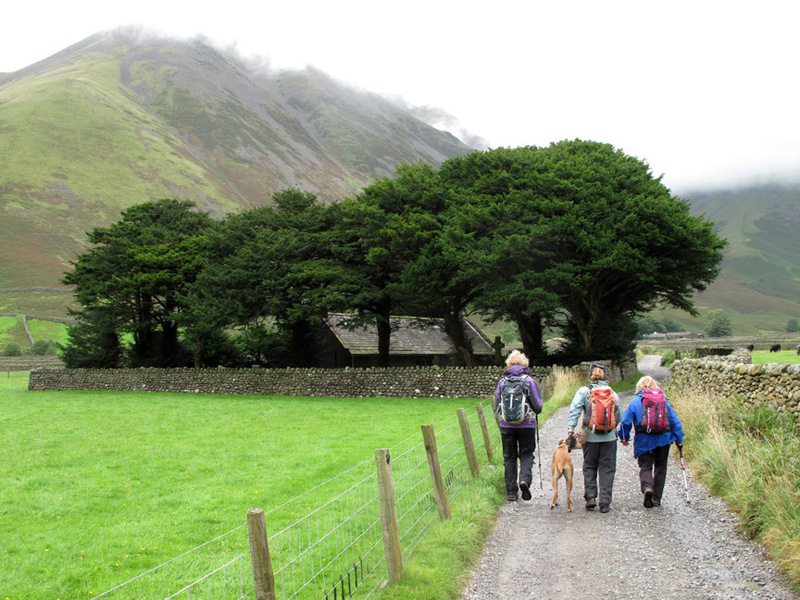 Walked with : Jo, Maggie, Ann and the dogs, Amber, Harry and Bethan. 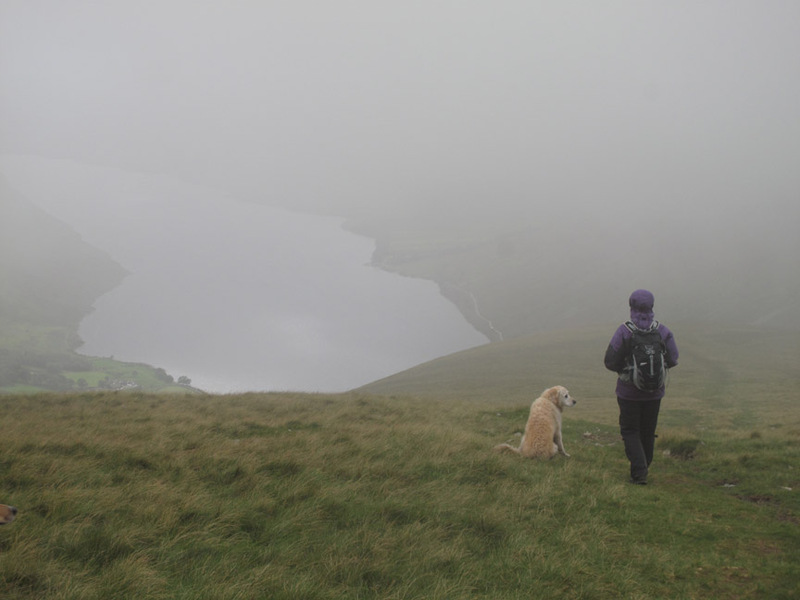 Weather : Low cloud with heavy rain at one point but the some sunshine early and late. 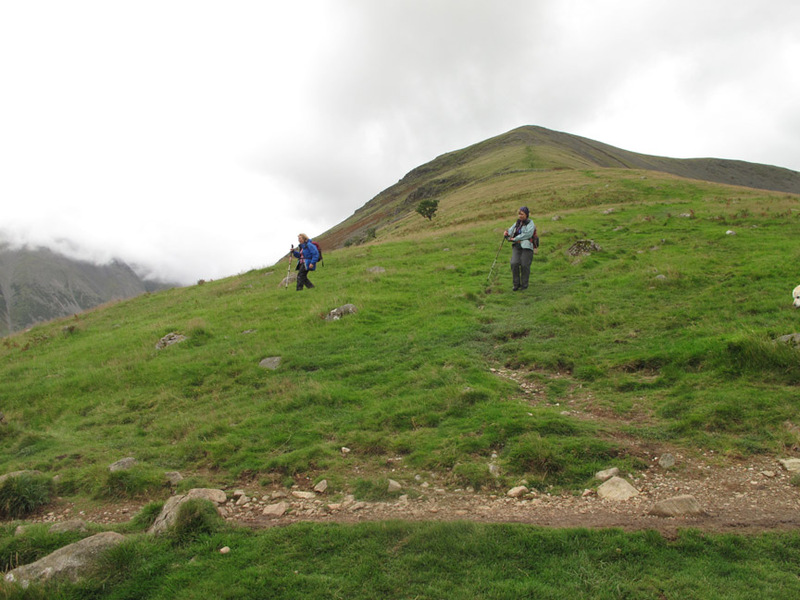 but a little perseverance gave us an excellent walk up paths new to us . . . and into exciting conditions we rarely experience. A walk that we will remember for a long time to come. 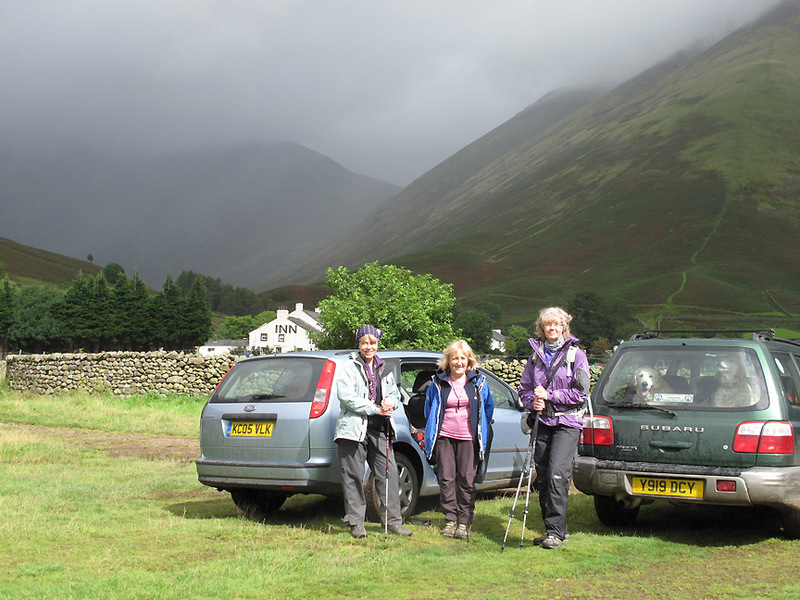 Parking at the Village Green at Wasdale Head. The forecast today appeared contradictory . . . clearing cloud but increasing rain showers. The Mountain Weather forecast didn't even agree with the Park forecast . . . weird. So we start with a group photo for today's walk . . . Jo, Ann Maggie and not forgetting myself, the photographer. A quick burst of sunshine, so the picture is taken even before the dogs were out and about. 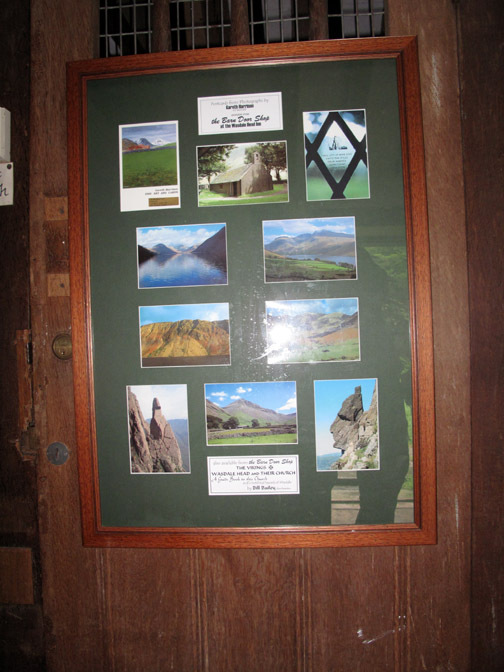 First stop was St Olaf's Church in the heart of Wasdale Head. 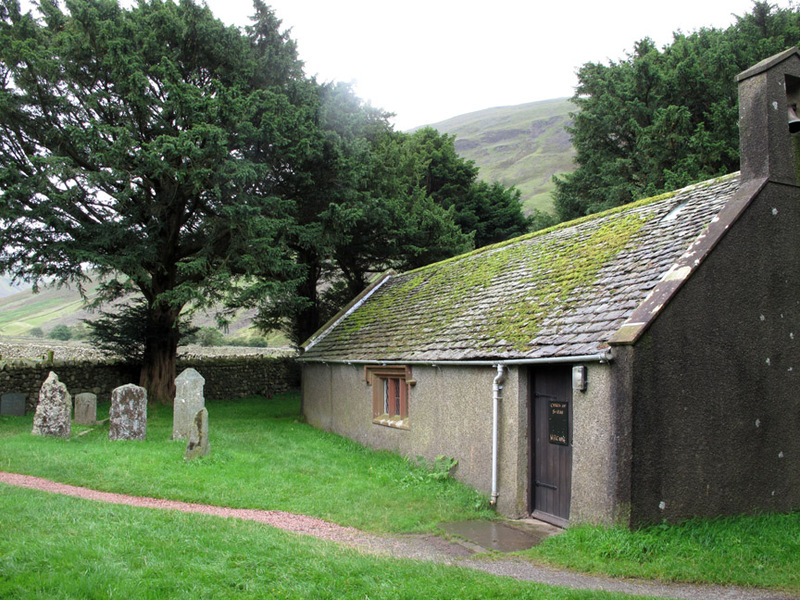 This tiny church, protected by Yew trees, is perhaps the smallest Church in Britain, and is the spiritual home of English rock climbers. A plain looking building from the outside gives no hint of the inner character. 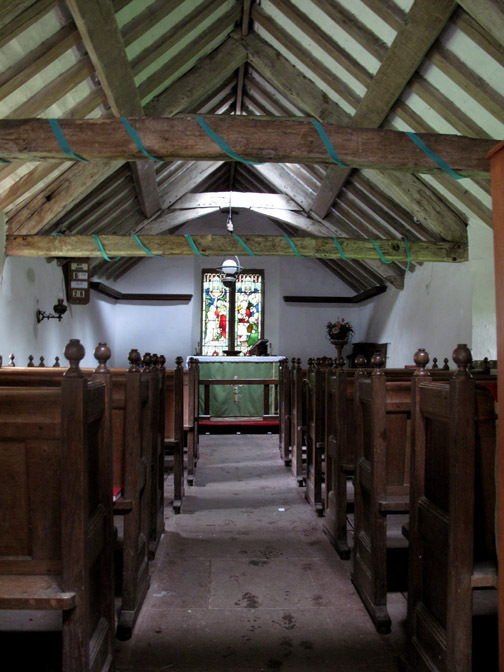 An old Church with ancient timber beams . . . kept in beautiful condition. 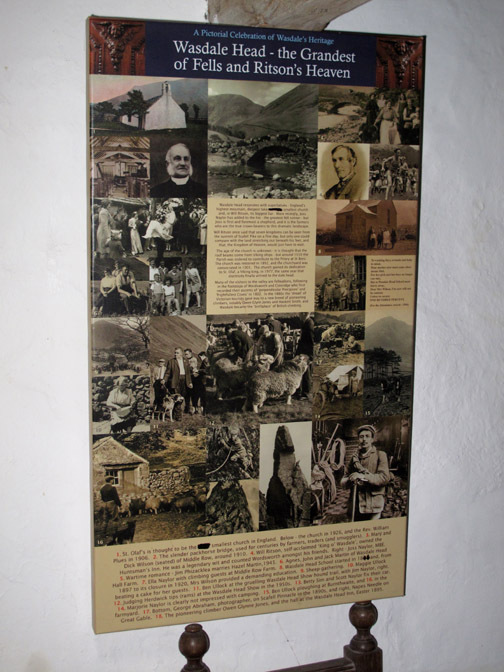 An information poster introduces visitors to the valley . . .
. . . and an example of many of the sights to be seen. 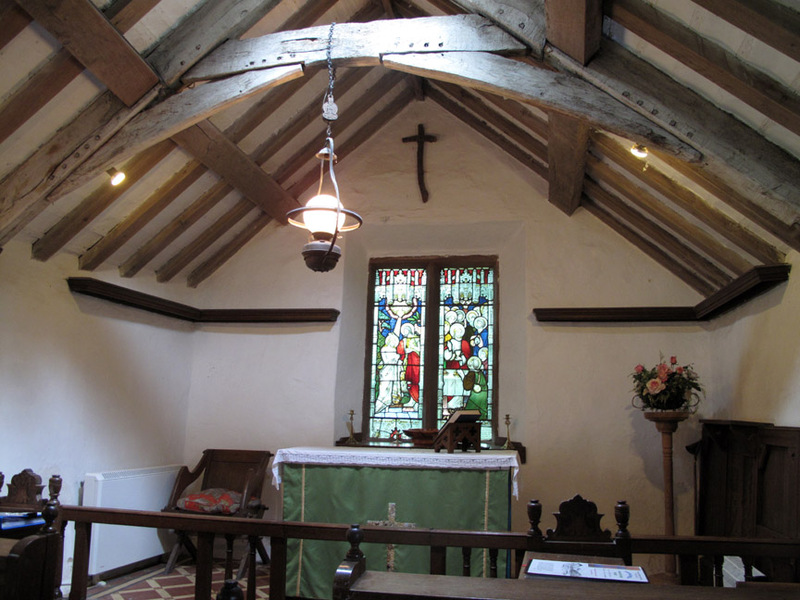 The beams are adorned with ribbon. The famous stained glass memorial is no more than 6" high. 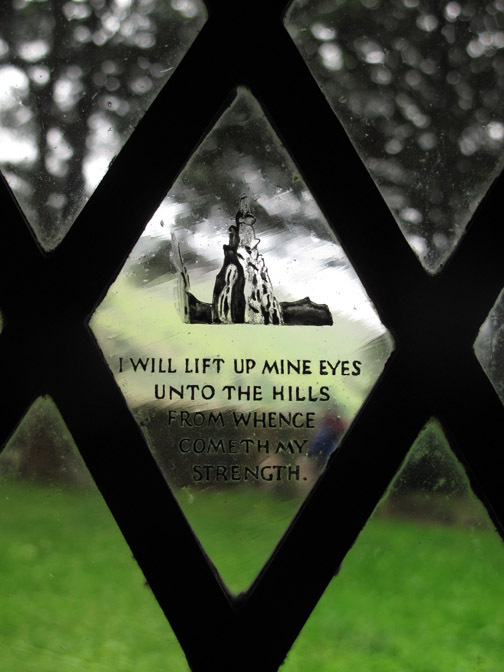 The Memorial window pane is to the Fell & Rock Climbing Club members who lost their lives in the first world war. Click here for more information about St Olaf's Church. 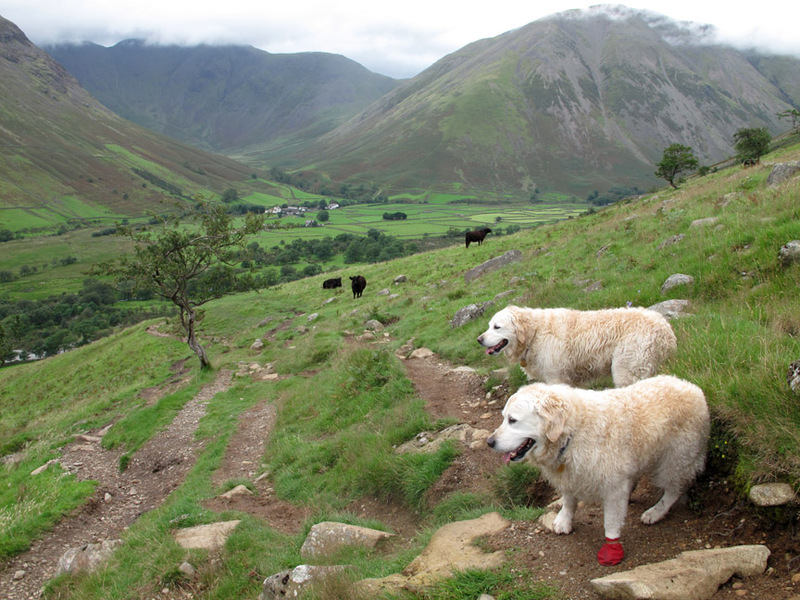 Our walk starts properly as we take the track towards the farm. 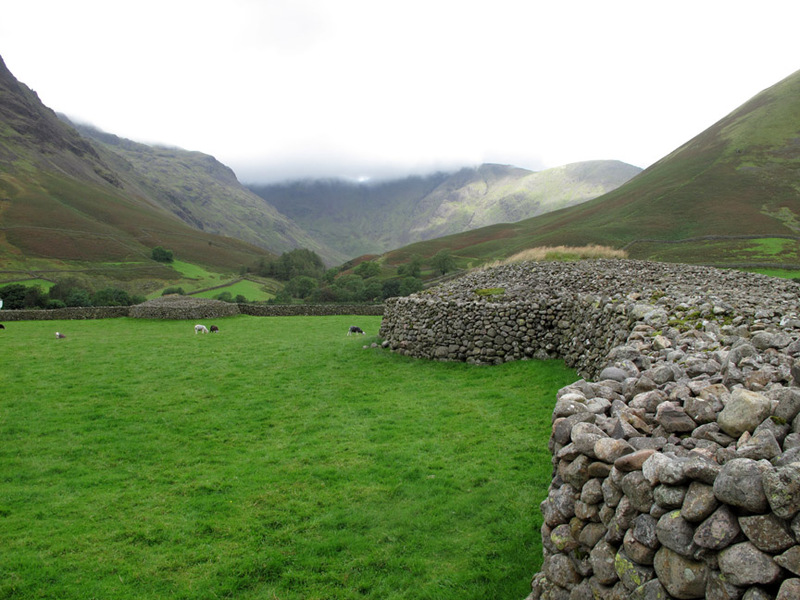 The piles of stones and thick walls are as a result of the farmer clearing the rock to allow the grass to grow. 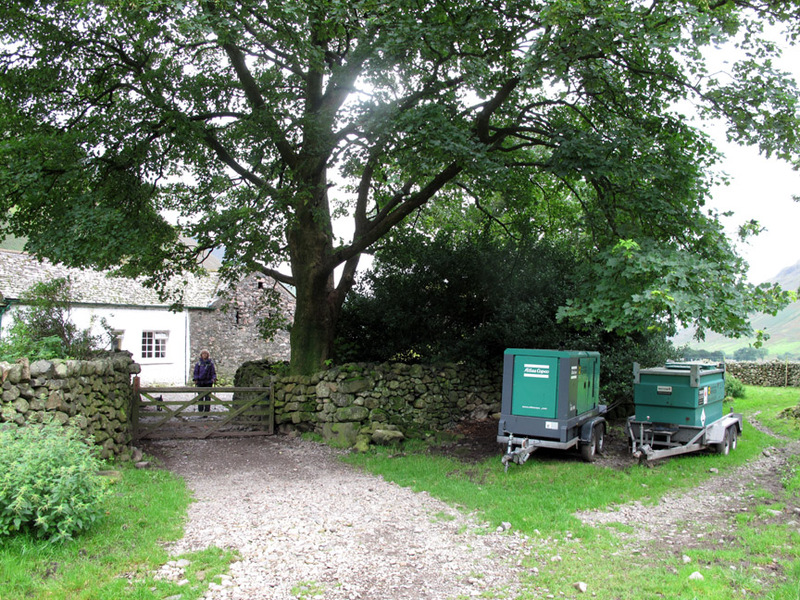 Burnthwaite Farm offers Bed and Breakfast accommodation and has an excellent reputation. Like all properties at the head of the valley they are still running on generators, as the mains supply has still not been fixed. 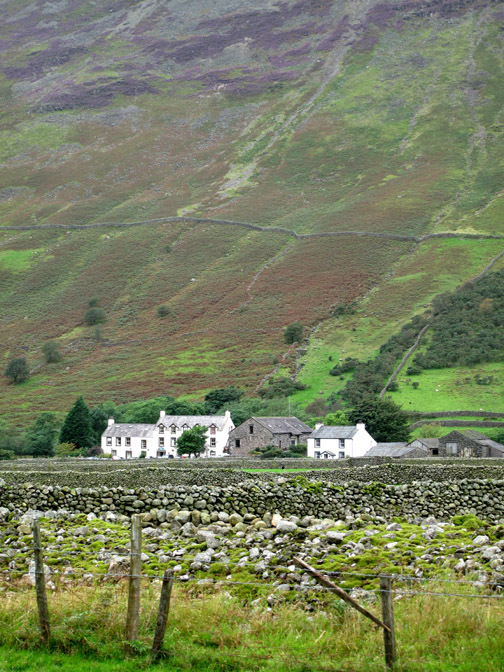 Wasdale Head Inn across a sea of walls. 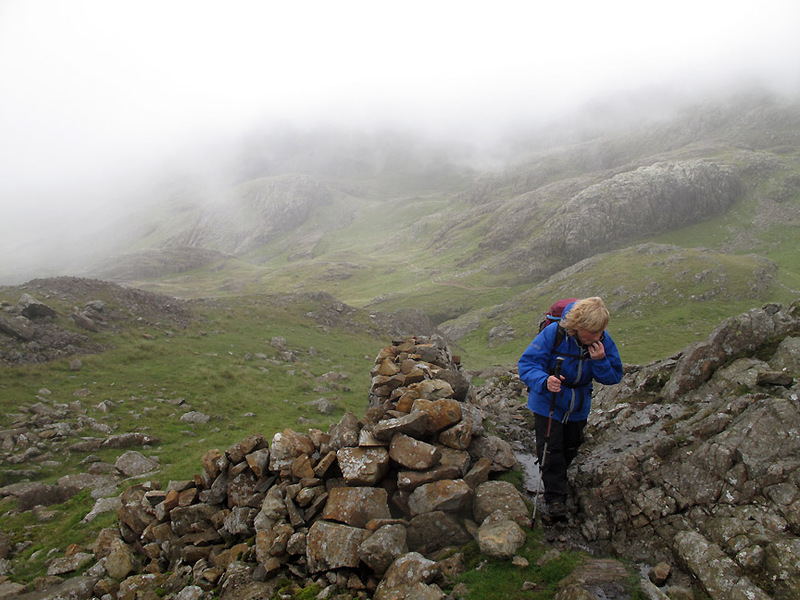 Maggie contemplates the direct ascent path to Great Gable. 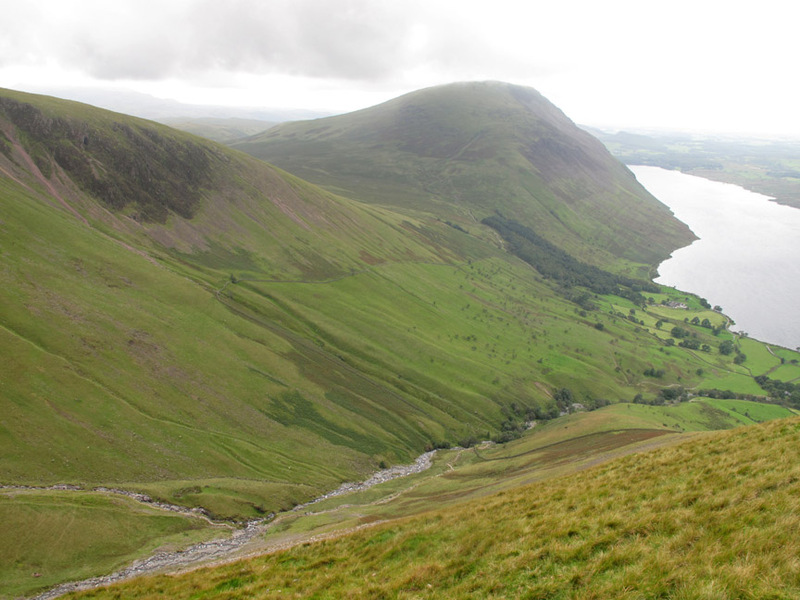 as we look back down the valley to Yewbarrow and distant Wast Water. 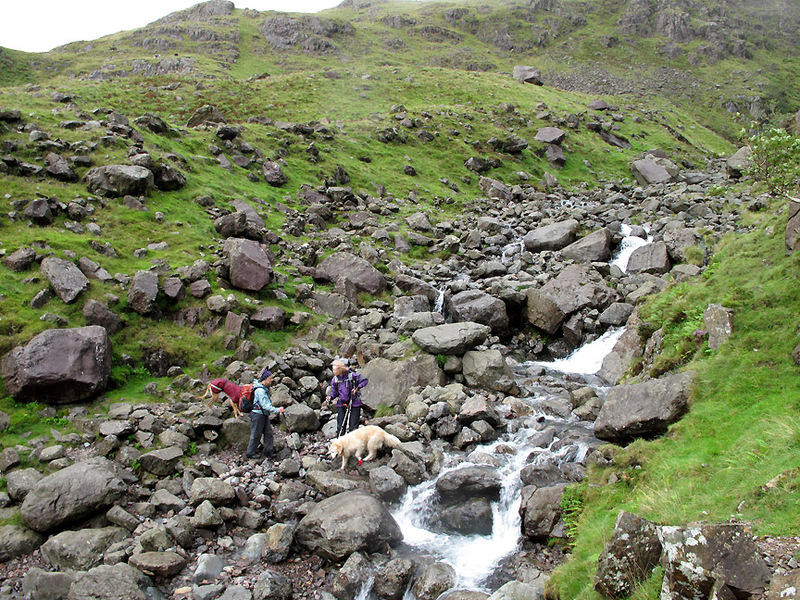 The first of many significant stream crossings . 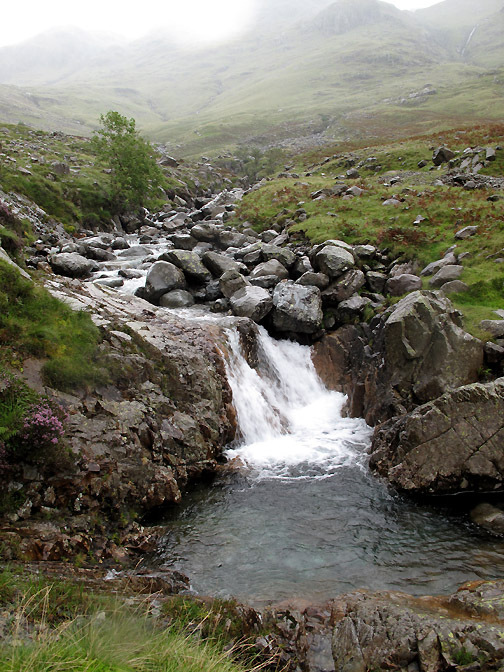 . . this one is Gable Beck. 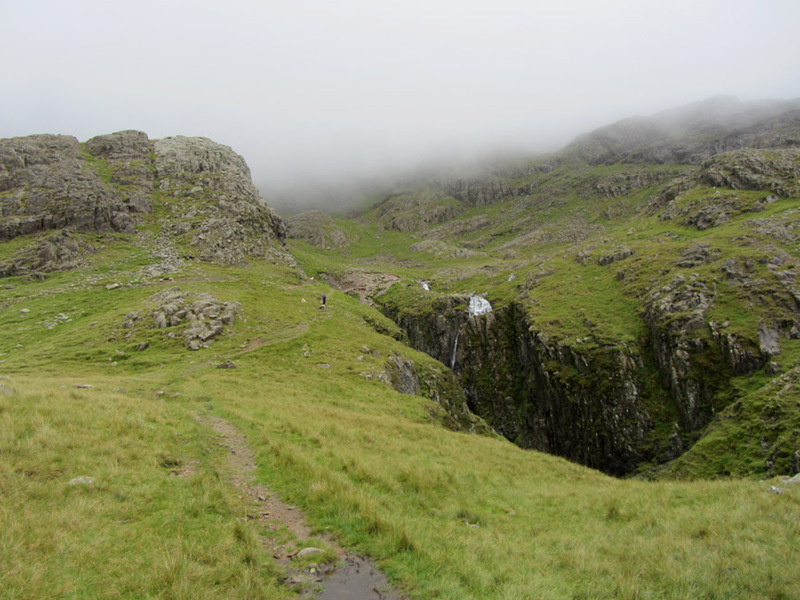 The main Styhead path can be seen climbing up to the left of the picture. We'll stay low and continue on the "old path". A last outpost of Scots Pine . . . colours are all muted greens. 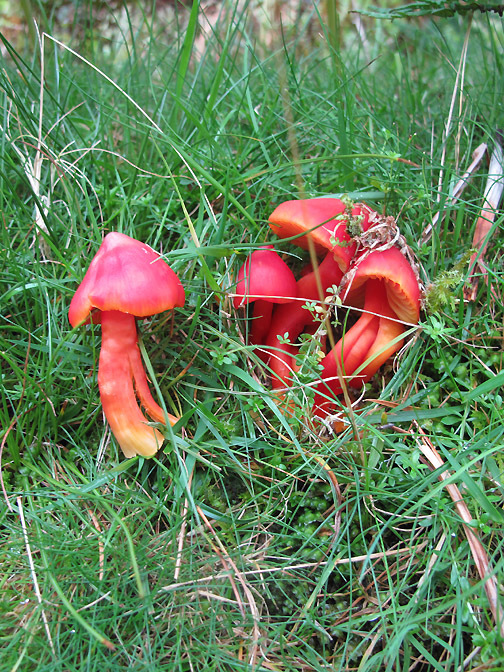 In contrast this bright red fungi has grown next to the river. 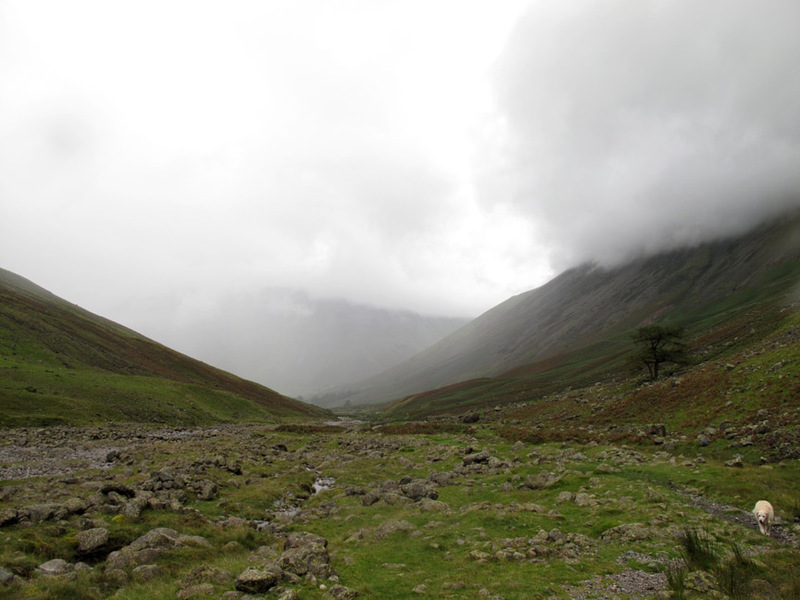 Things were going well till we turned around and found the weather storming up the valley to meet us. 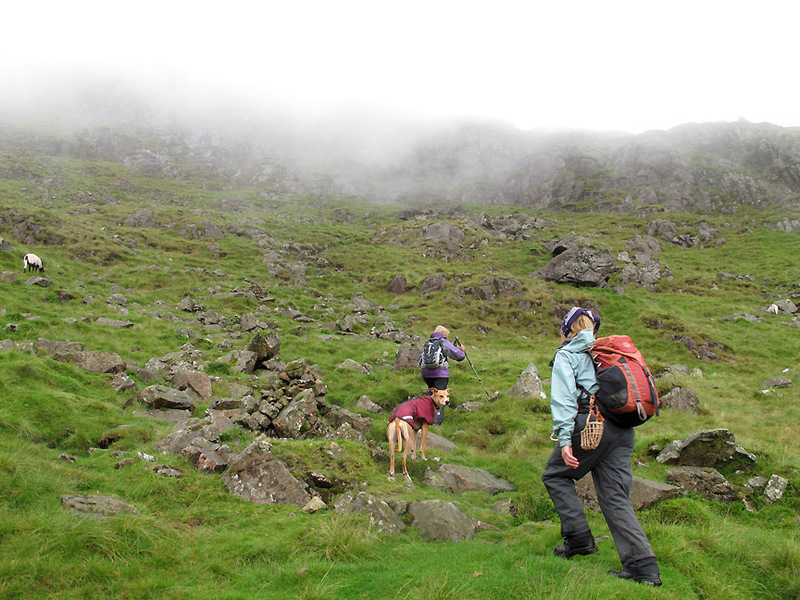 We'll stop up ahead and perhaps get a coat out . . . no we won't . . . it's full waterproofs a.s.a.p. ! 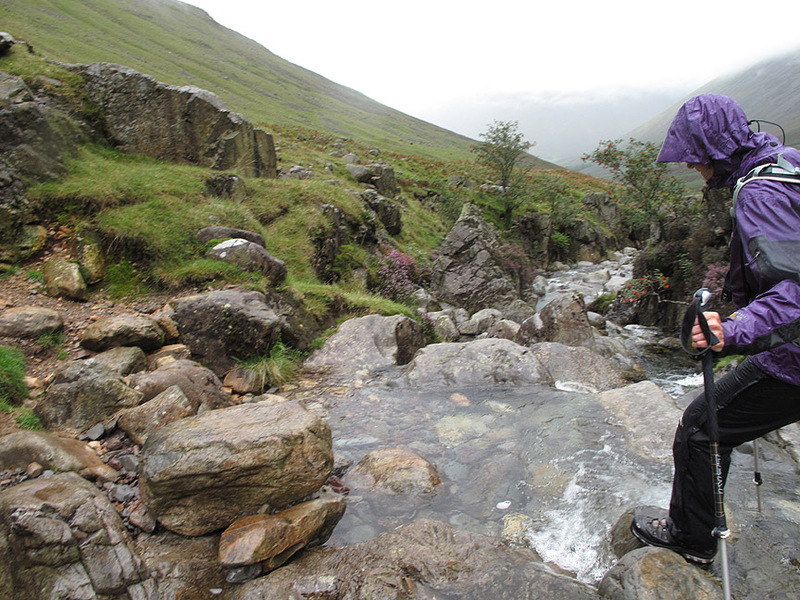 The rain and dull conditions take the edge . . .
. . . off the emerald pools on Lingmell Beck. 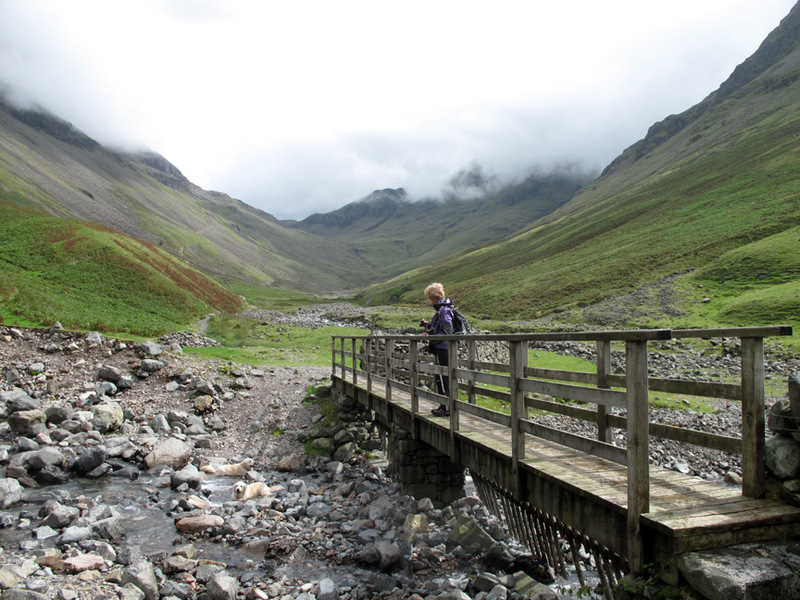 Time to leave the main valley and cut across to start our ascent of Lingmell via the Piers Gill path. Recent rains have filled the becks with water . . . the current rain is keeping them topped up ! 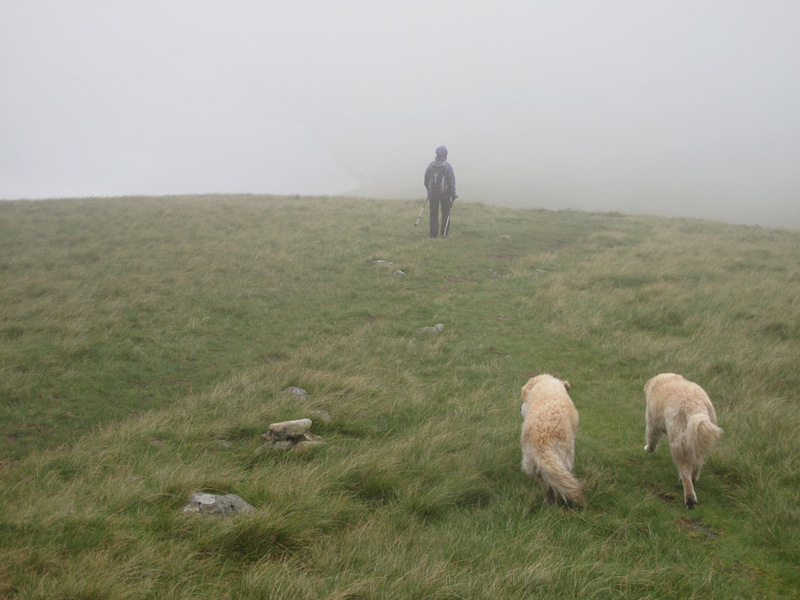 There does come a time on some walks where the conditions appear to be so bad that enjoyment takes a back seat to effort. 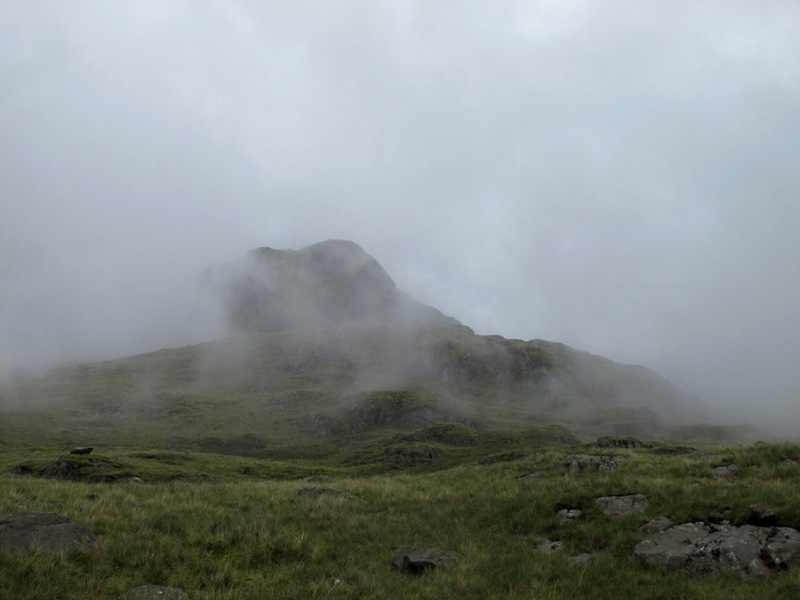 but the rain was easing, the cloud base was lifting and optimism was returning . . . let's see how it goes. and it was suggested that there was even a little blue sky up there . . . we continue a little further. 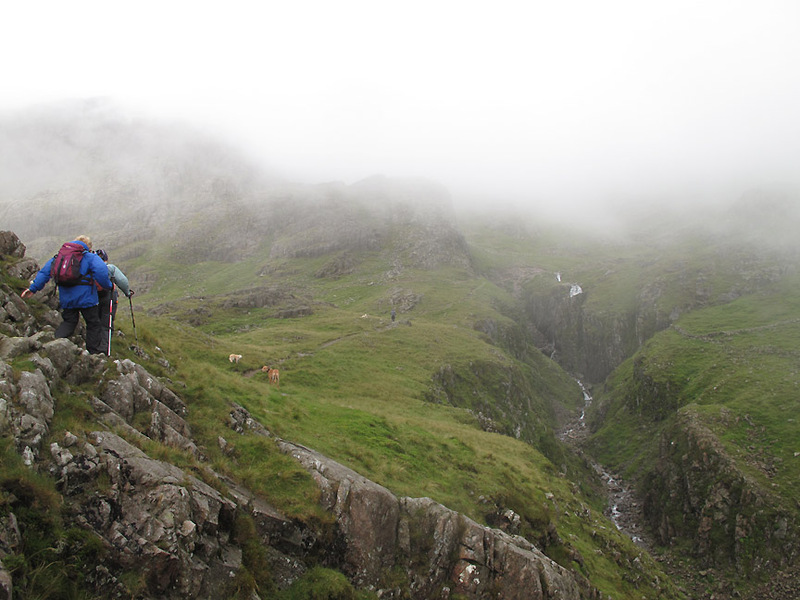 we'll almost certainly be in cloud at the summit but the views down here are improving all the time. 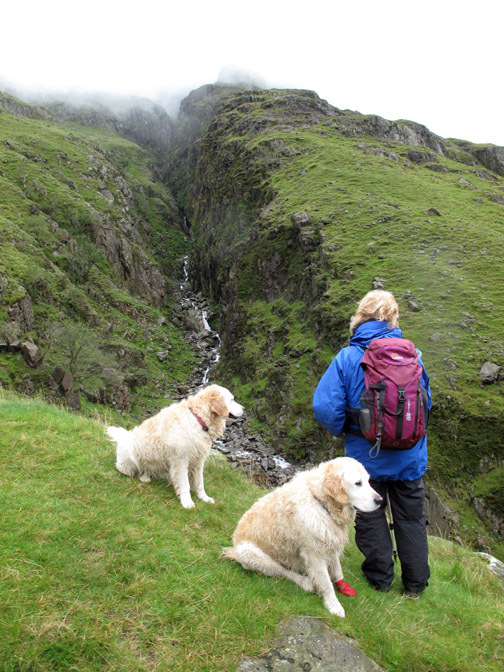 Ahead is the first main turn in the Piers Gill and the start of the deep ravine that we had come to see. Another stream crossing . 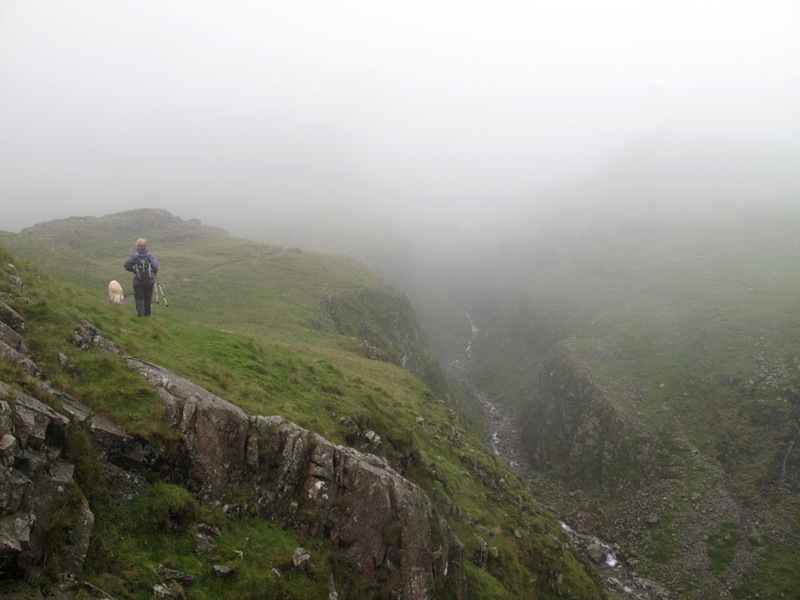 . . this time the Greta Gill from Lambfoot Dub, high above us in the cloud. 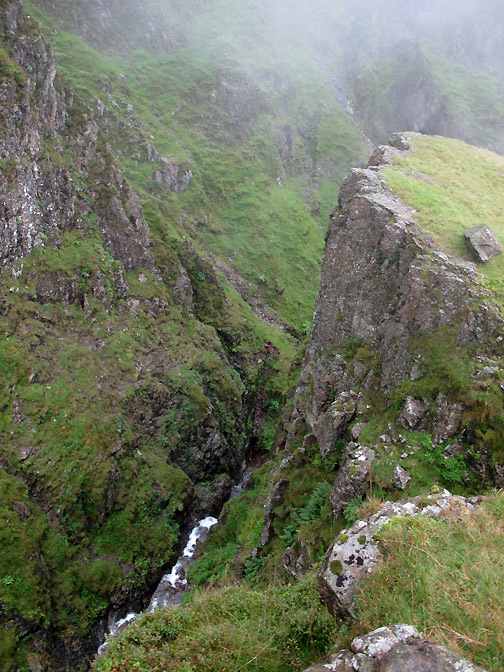 The first close up view of the Piers Gill Ravine . . .
. . . there's no path down there so we stay well above it. 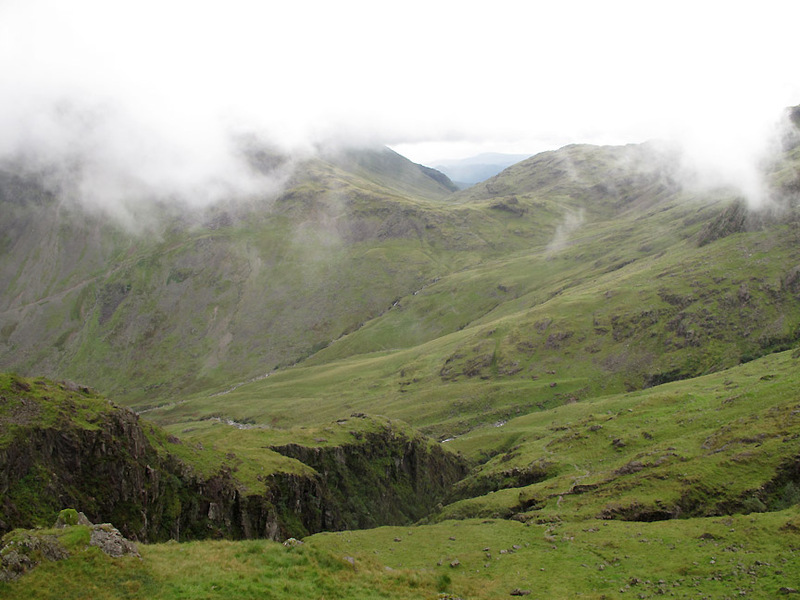 As the cloud comes and goes we get tantalizing views over Styhead to Borrowdale beyond. The path has a rock step that needs to be negotiated. 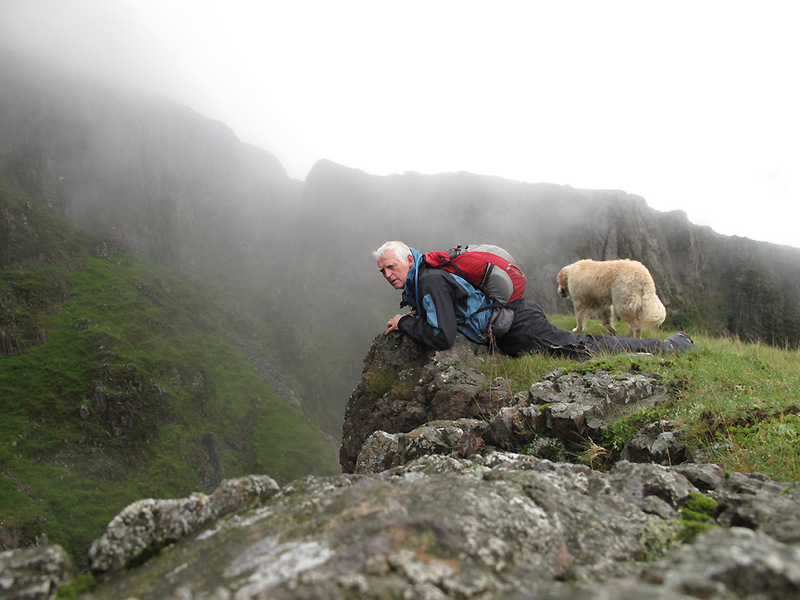 The only problem is to try and identify where it was and how to climb it. 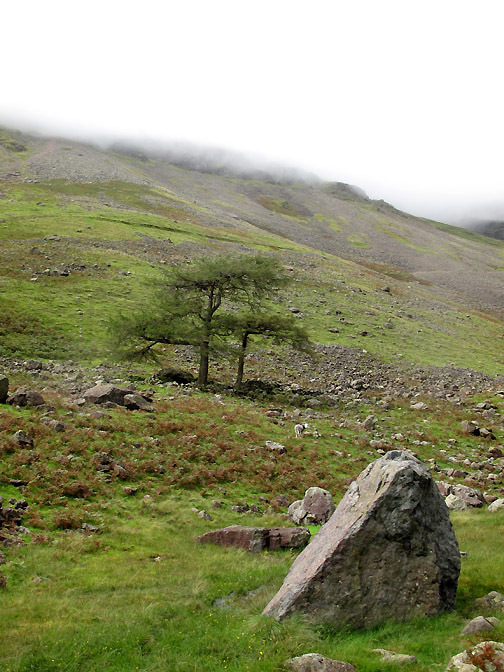 We were tempted to stay close to the ravine but were guided away by the two small cairns seen here. 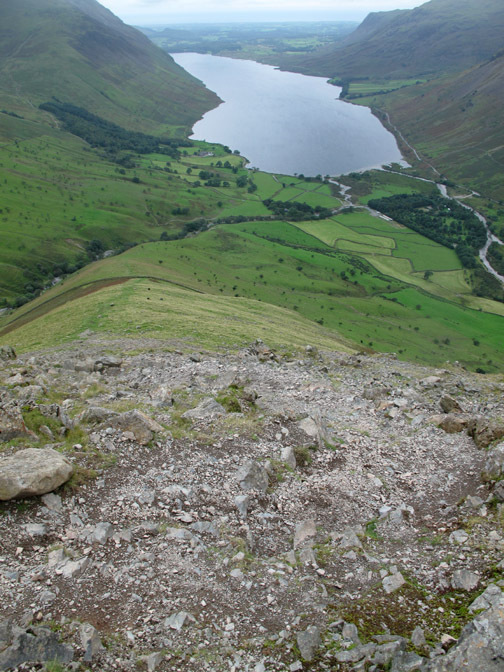 the route or the detail of the climb. It's not a well used route, so the path is often indistinct. scratched in the lichen on the rock next to Harry. Here was the " rock band "
and it was a straight up climb on slippery rock for all concerned. and had presumably left their scent. You can trust your dog's instincts on many things but they got it slightly wrong on this one. 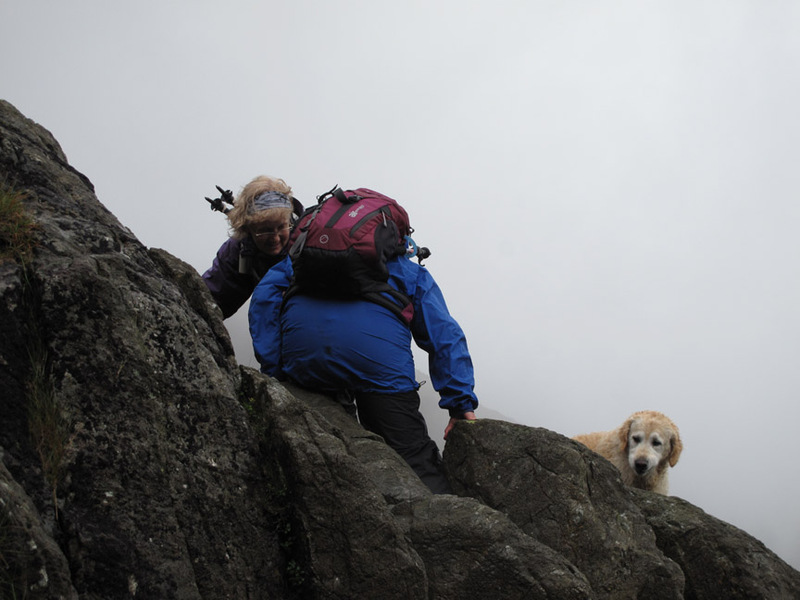 Sure they found the ascent route up and over the rock and with a little help from myself we scramble up the face. 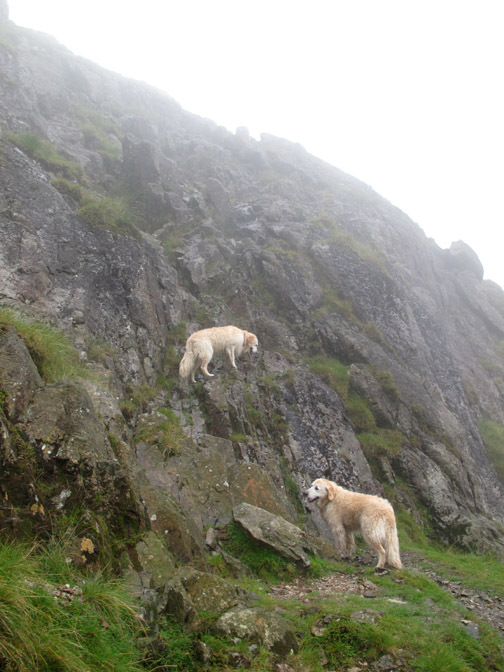 Ann and Maggie however scrambled halfway up, bypassed the tricky bit and topped out before me ! Crazy dogs . . . why didn't you sniff out the easier way ? 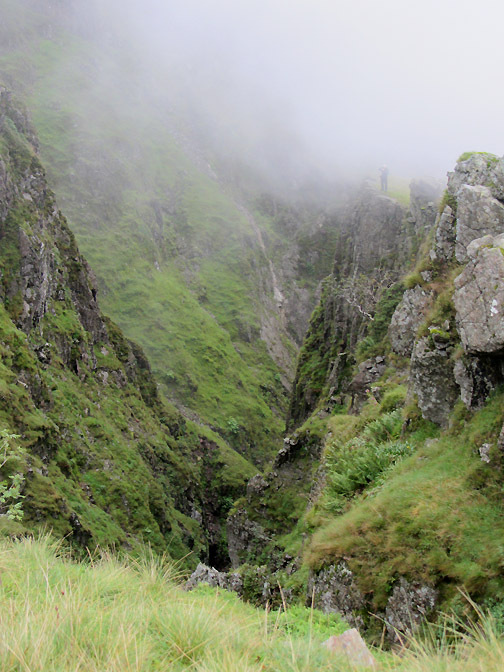 On the turn of Piers Gill, alongside the deepest part of the ravine . . .
. . . the cloud cleared to reveal myself on the cliff further down. 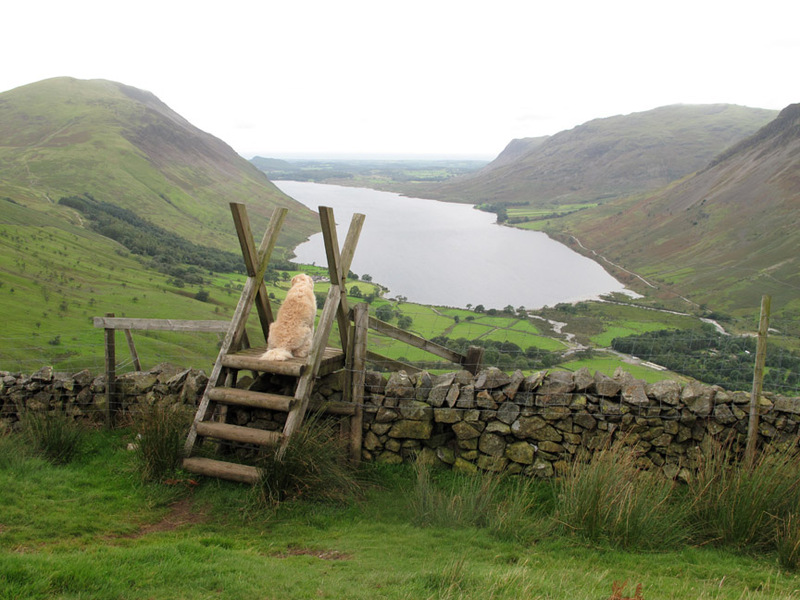 Maggie suggested there was a fine view over the edge and looking straight down into the ravine. I set the camera on self-timer and took a look. She was right . . . it was an impressive drop . . .
. . . looking both downstream and up to the girls on the higher cliff. 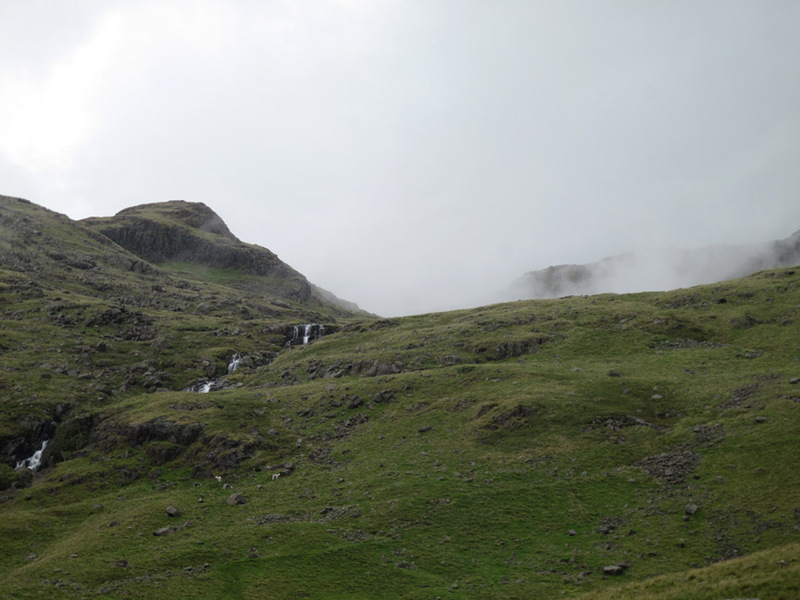 and the virtually unknown nature of the route. It has been climbed by many but it was the first time for Ann and myself. 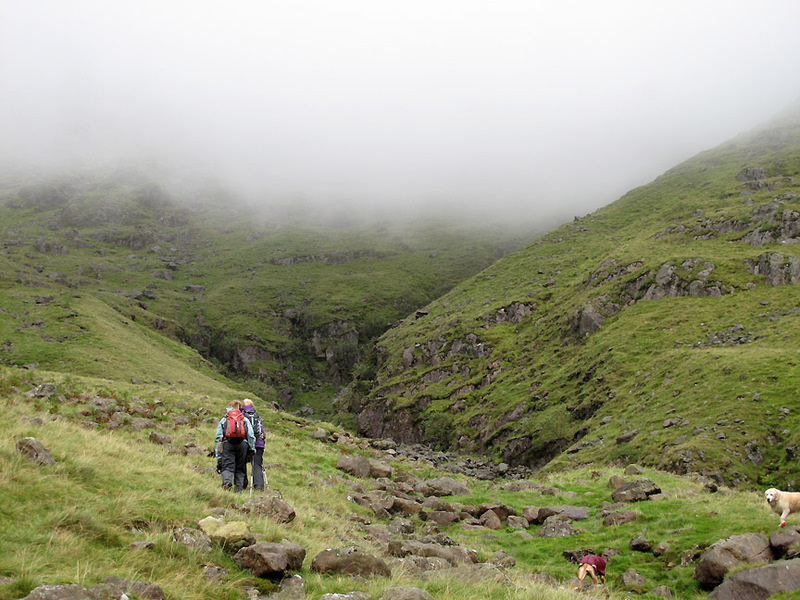 Onward into the mist now as we near the top of the Piers Gill ravine. 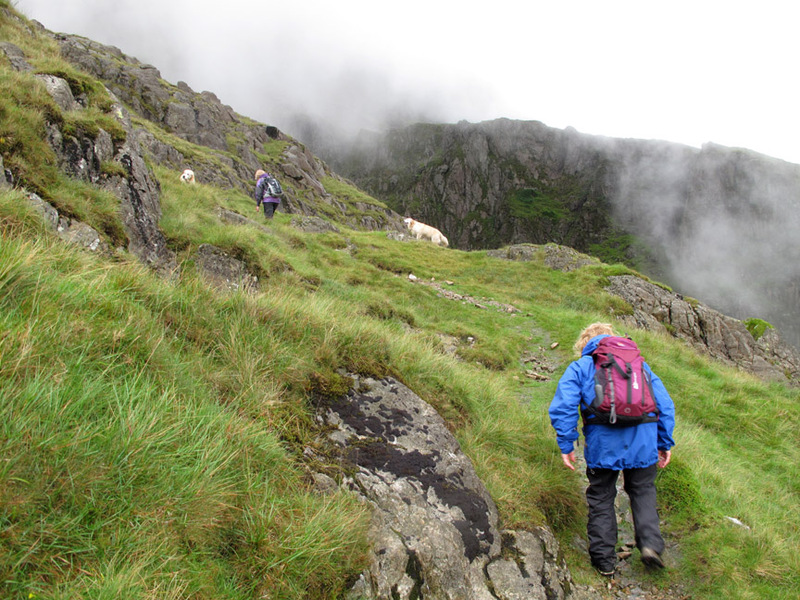 As we climb so the cloud lifts and we are rewarded by ever-improving views. 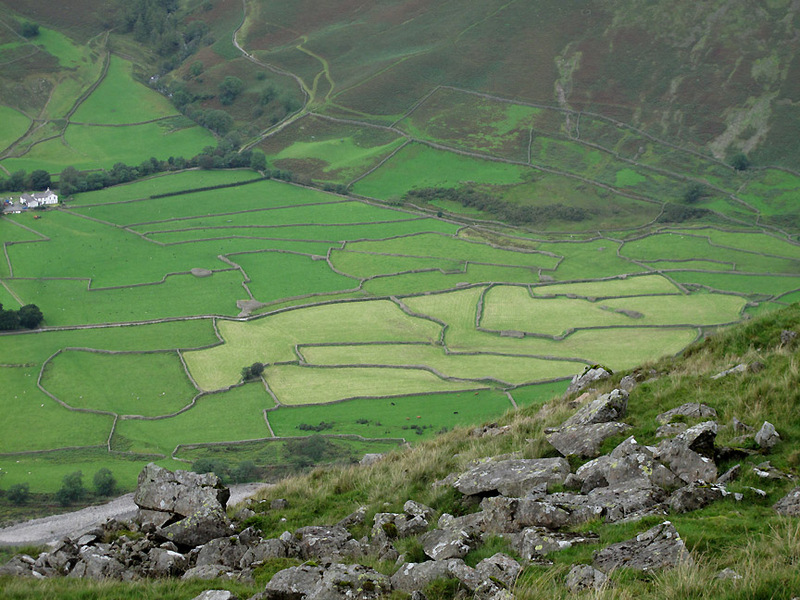 which has traversed over from Styhead Pass. 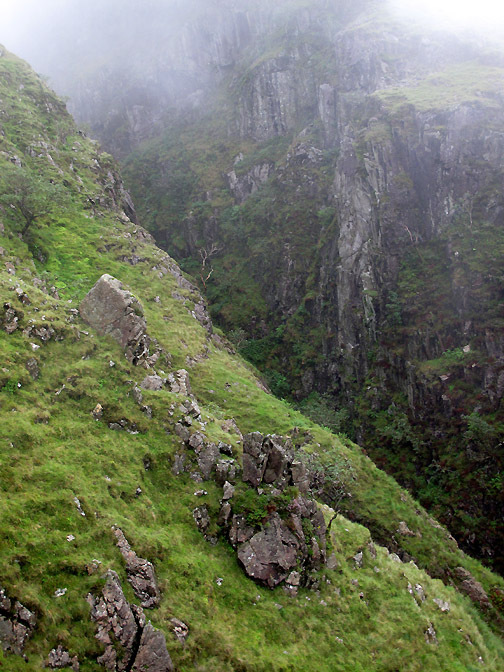 Here the classic view of the ravine, seen by so many from that path, but seen with a new understanding by us today. 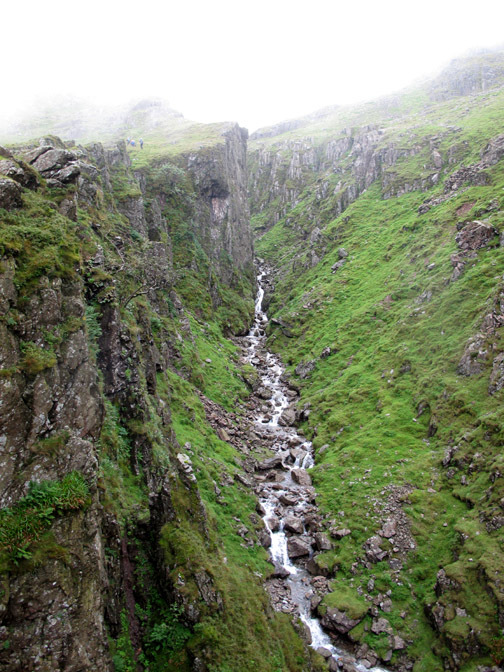 Surprisingly the final part of the Piers Gill doesn't actually flow in the cutting . . . it flows in from one side as a waterfall. 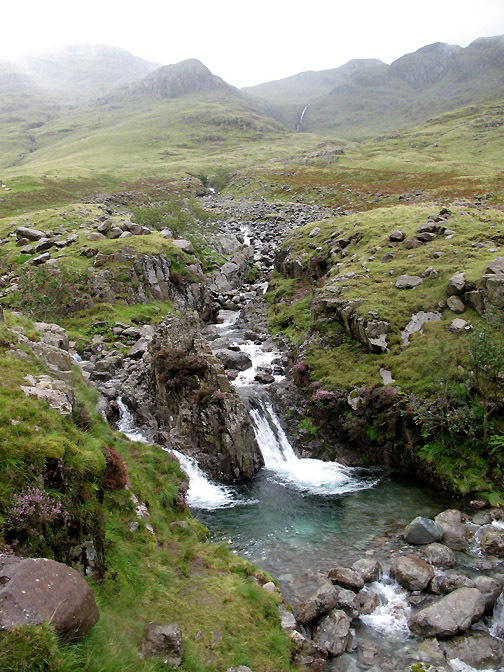 Another stream crossing now and we can relax a little more as we are on familiar territory. 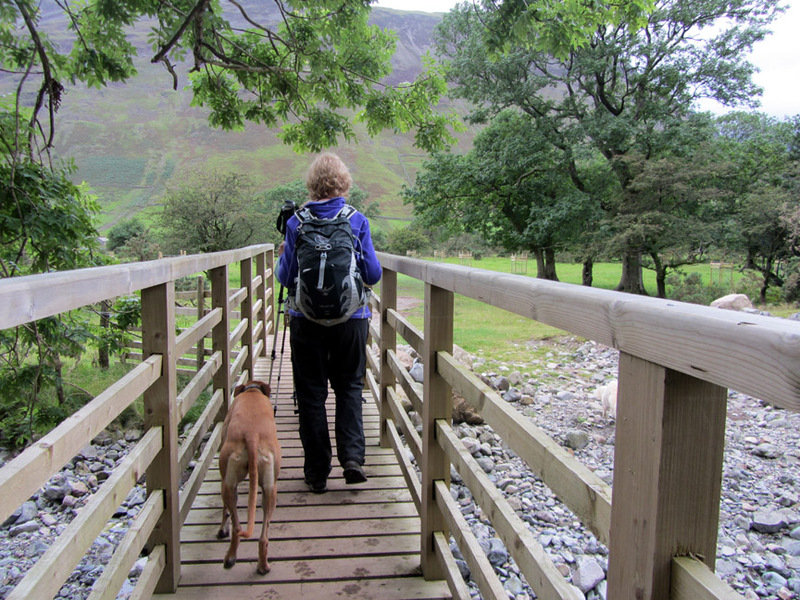 to allow us to see Derwent Water beyond Castle Crag. 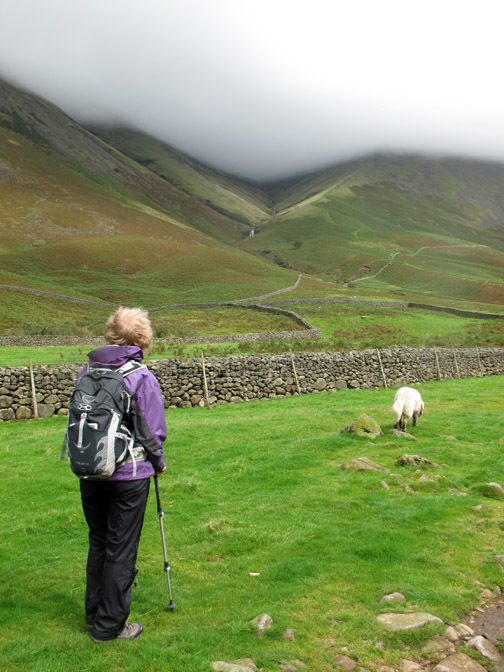 Ann takes a drink from her water bottle tube as she climbs up the path to Lingmell Coll. 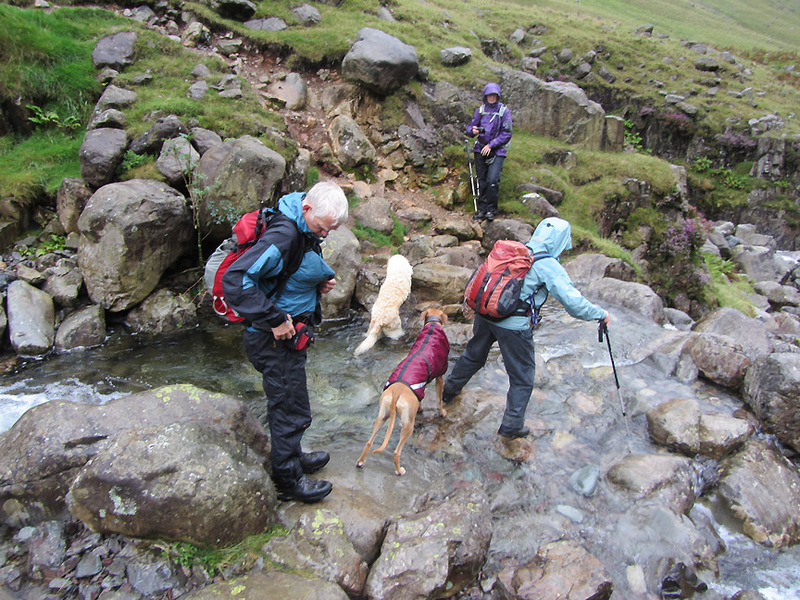 Thirsty work especially as we have delayed lunch till we reach the summit of Lingmell. 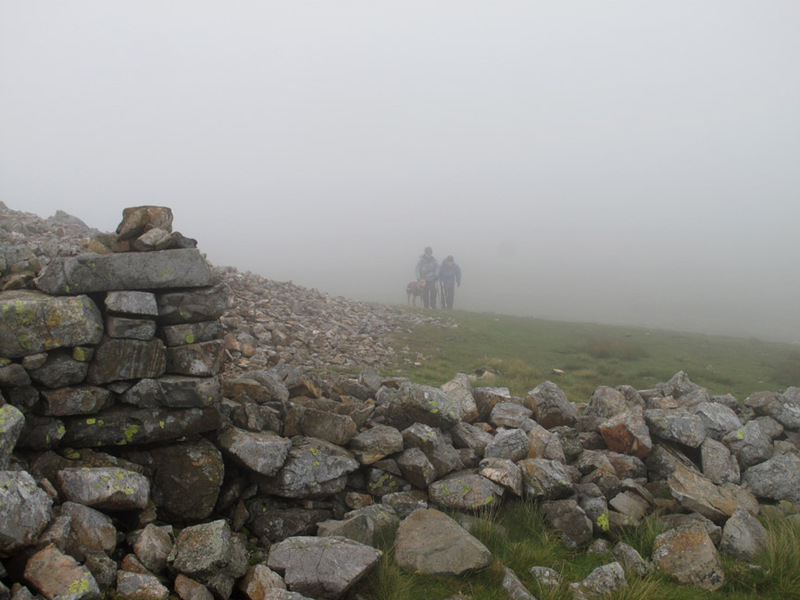 A short climb leads us firmly into the cloud but there's no disputing the summit of Lingmell. 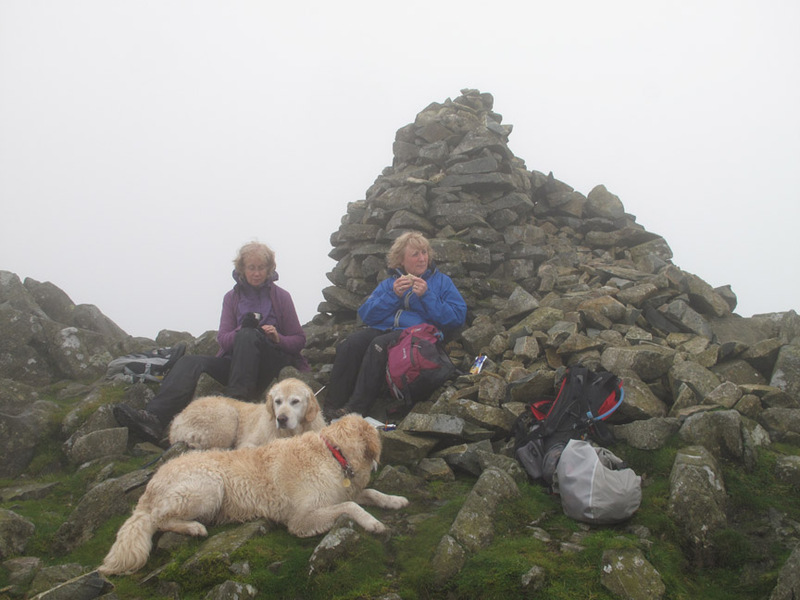 In the shelter of the cairn we can relax and enjoy our sandwiches at last . . . deferred gratification you could say. 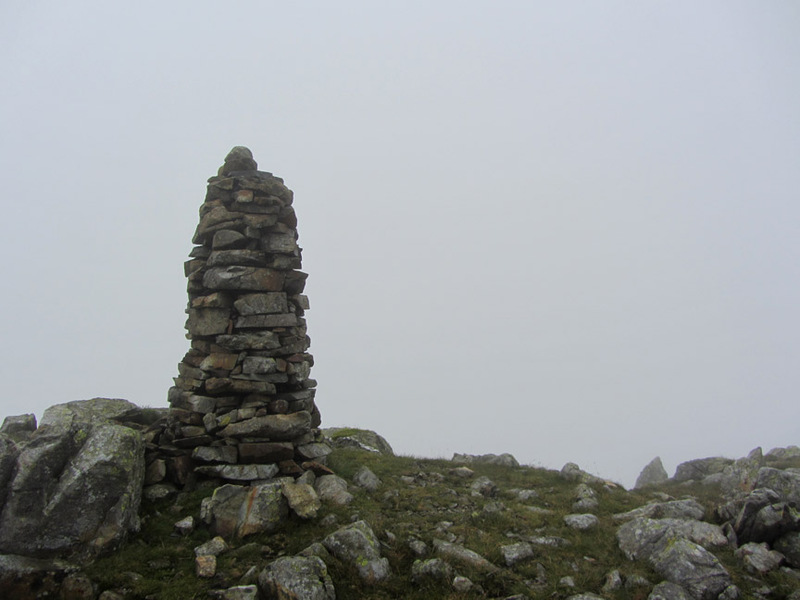 It would be downhill all the way now but we wanted to visit the second cairn on the summit. Easy to find on a fine day . . . but not dificult to find today either. 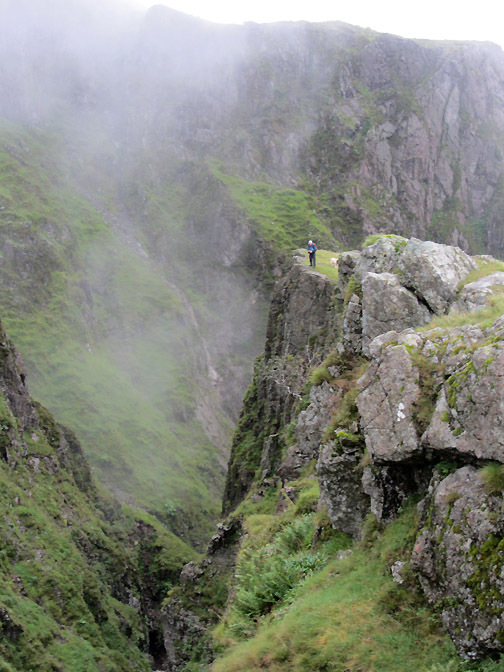 Keep the big drop to your right but don't fall down it and the tower will appear as if by magic out of the mist. Jo and Amber stop by the cairn for a photo. 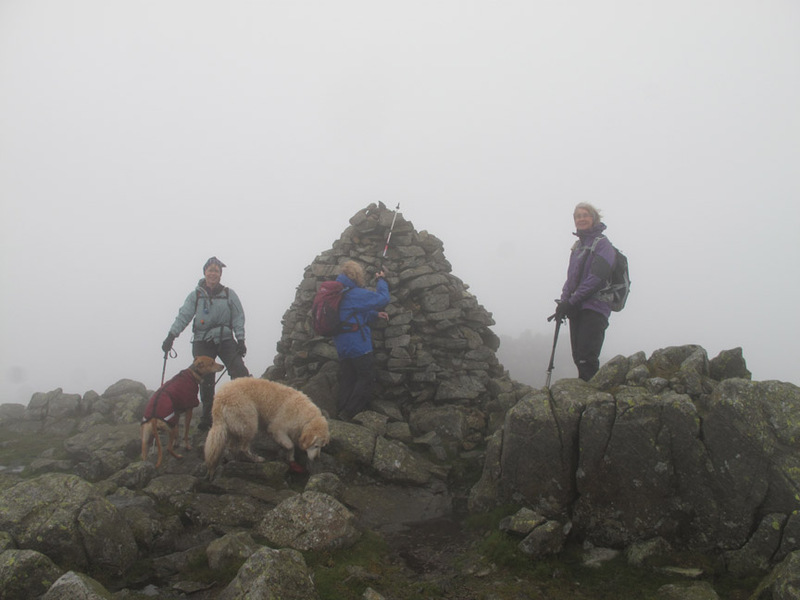 Leaving the summit and looking back as Ann and Jo appear out of the mist. Maggie leads the way forward followed by two sheep . . . I mean dogs ! 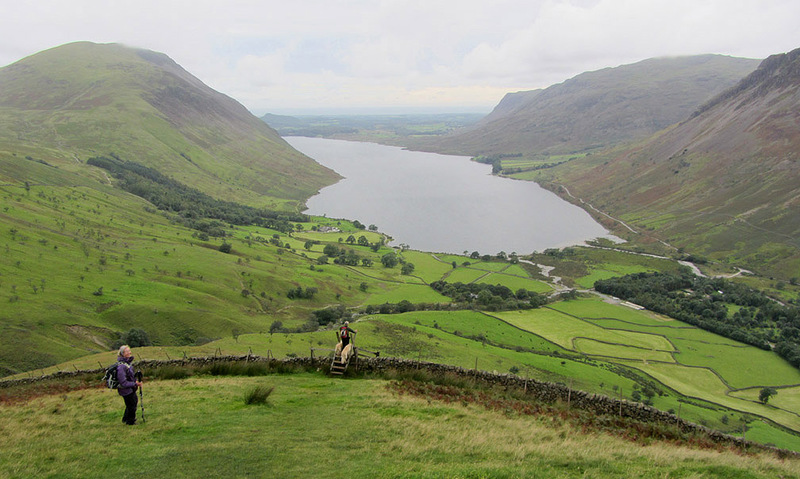 Gradually the mist thins and clears and we get views down into Wasdale once again. 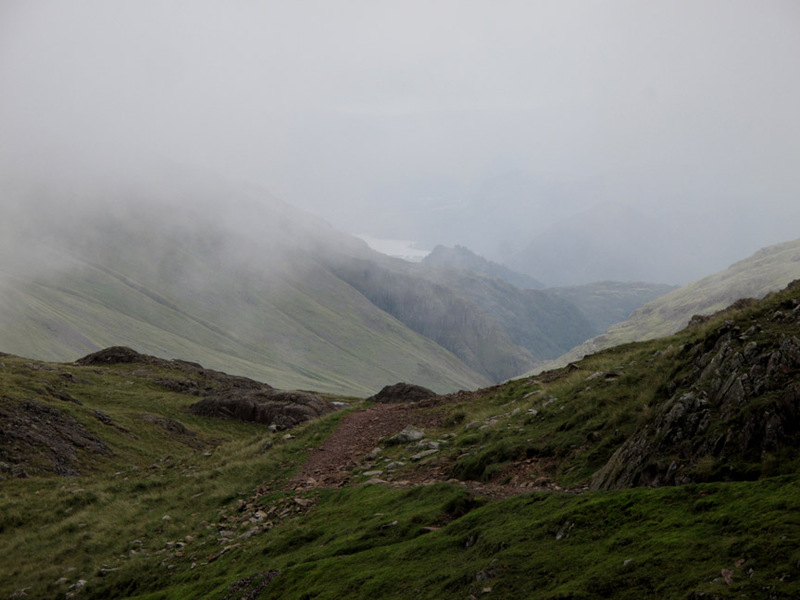 To the left is the Brackenclose route up Brown Tongue to the summit of Scafell Pike. 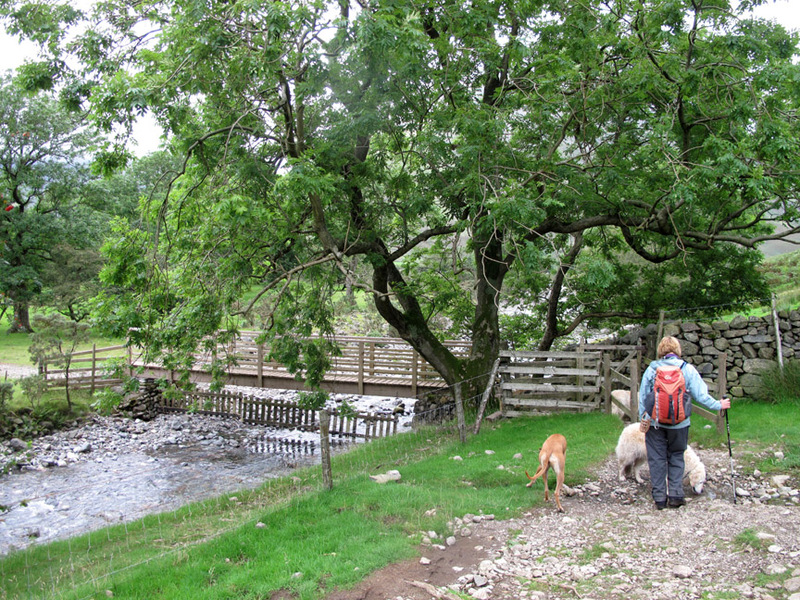 I know that river crossing and wooded area well from the Three Peaks marshalling visits over the years. 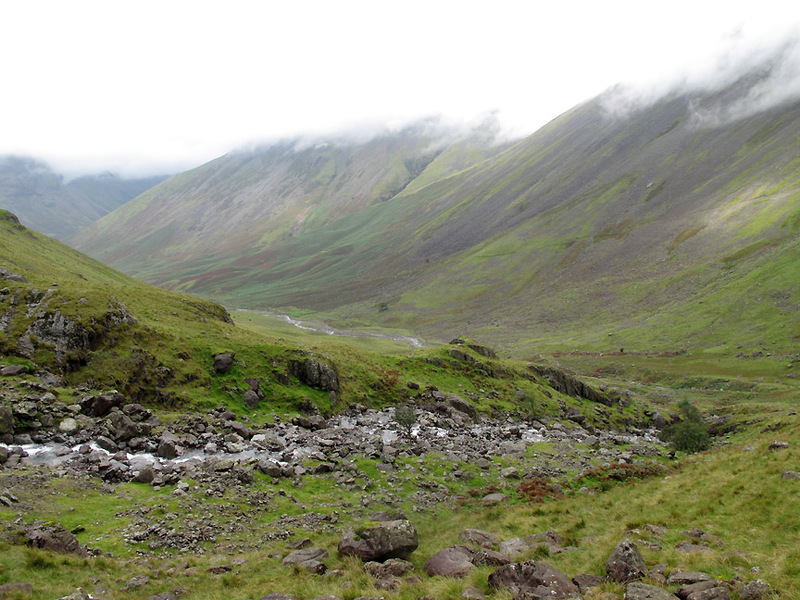 On the other side, the views open out to Wasdale Head and the Mosedale Valley. 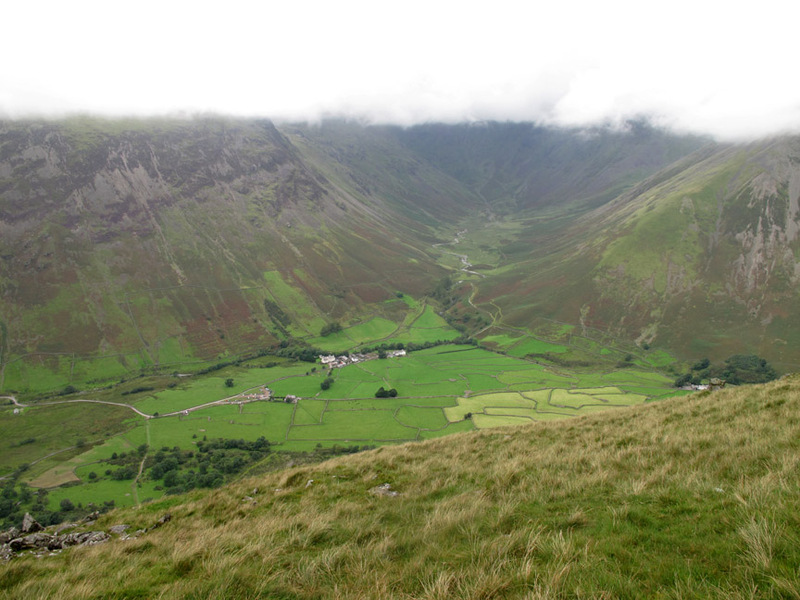 Yewbarrow, Red Pike, Pillar and Kirk Fell appear as one under the thick cloud base. Looking down on the complex wall systems we passed earlier. The wide piles of stones we passed at the start of the walk and the trees around St Olaf's Church, can be seen in the photo.
" Are you my Mummy ? " This delightful, wide-eyed Herdwick lamb thought Bethan one of flock . . . until she turned round to see who was approaching. 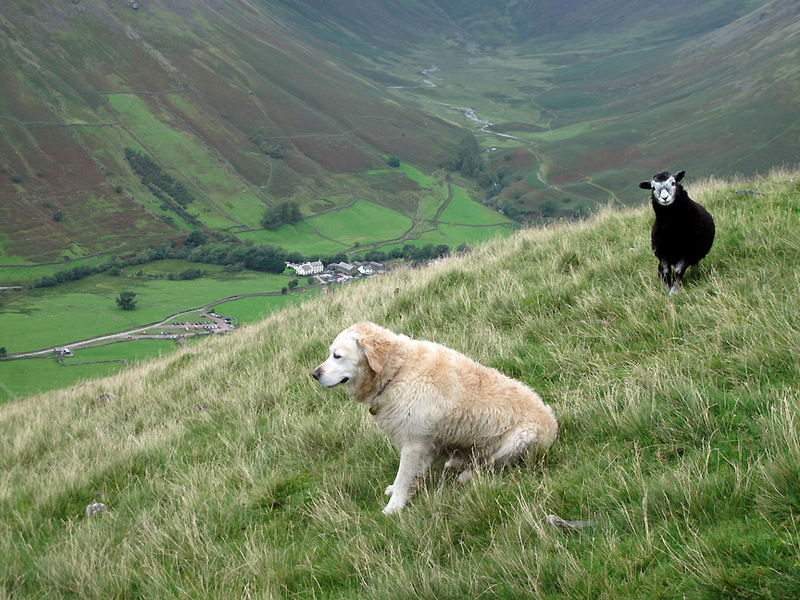 Realising the mistake, the lamb turned and left . . . Bethan was totally non-plussed. Lingmell's gentle slopes became steeper, first with a pitched path . . .
. . . then a slippery section of loose track through the scree. We were soon through and back onto grass . . . with the western valley displayed before us once again. The drop on the other side is steeper than expected so Bethan waits till we arrive. 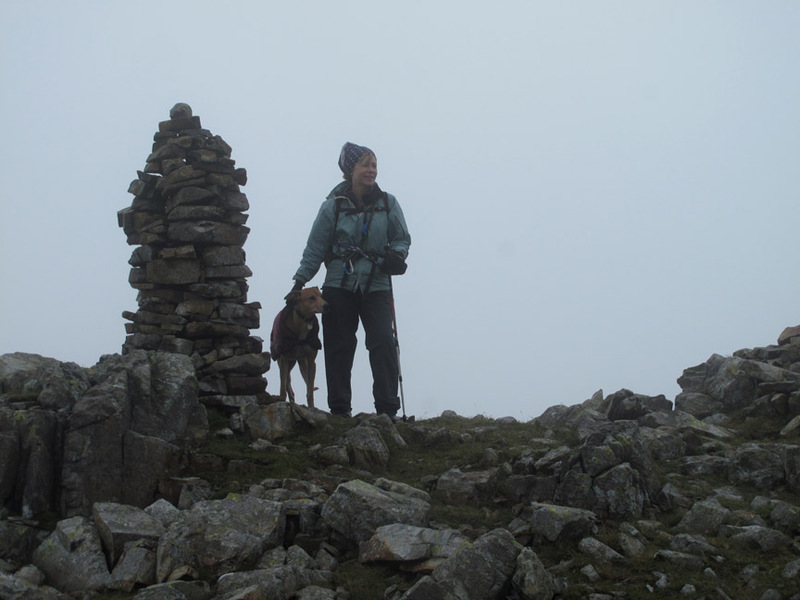 Jo stops mid-stile for Ann to catch a photo. 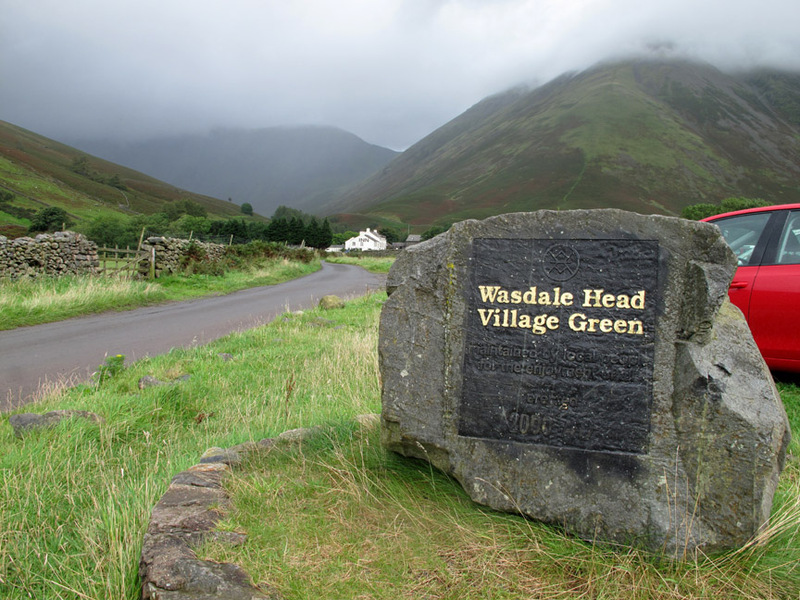 Wasdale Head Inn now as the cloud slowly lifts from the fells. 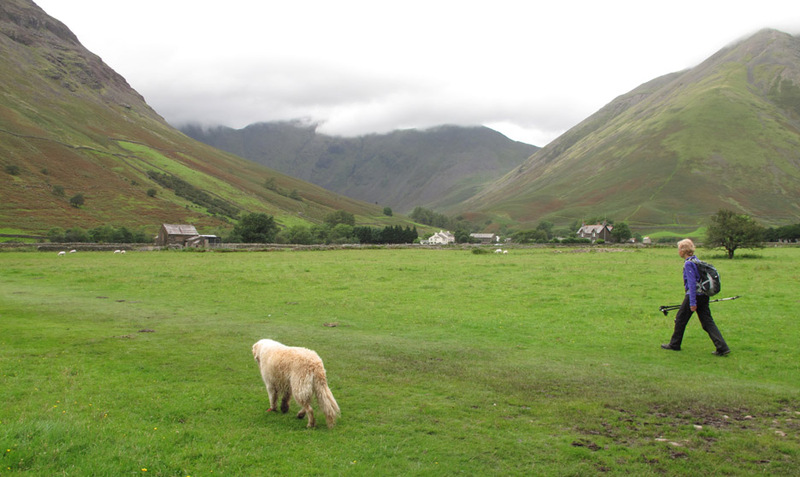 Nearly home now as we make one last turn and join the Brown Tongue to Wasdale Head path. 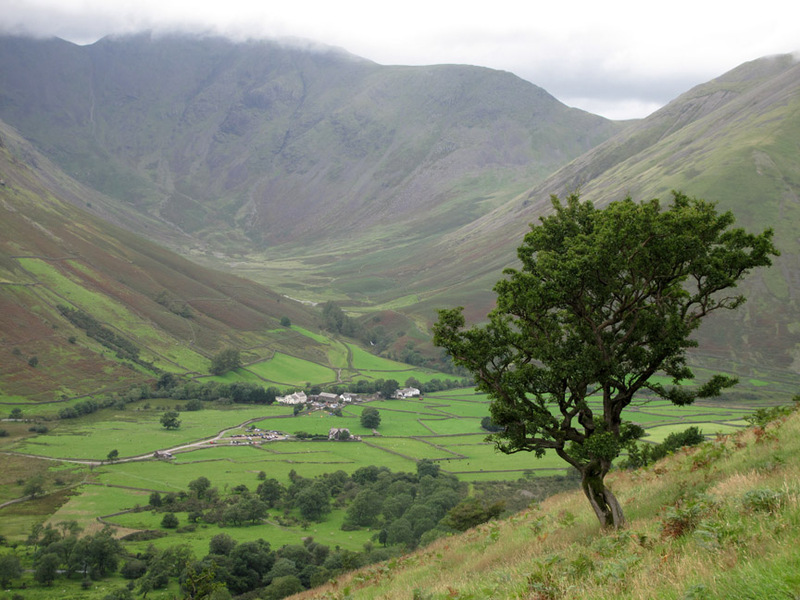 The main Brackenthwaite route to and from Scafell Pike is down in the valley to our right. Confident though they are, the dogs are never too keen on cattle so they hold back for my company. 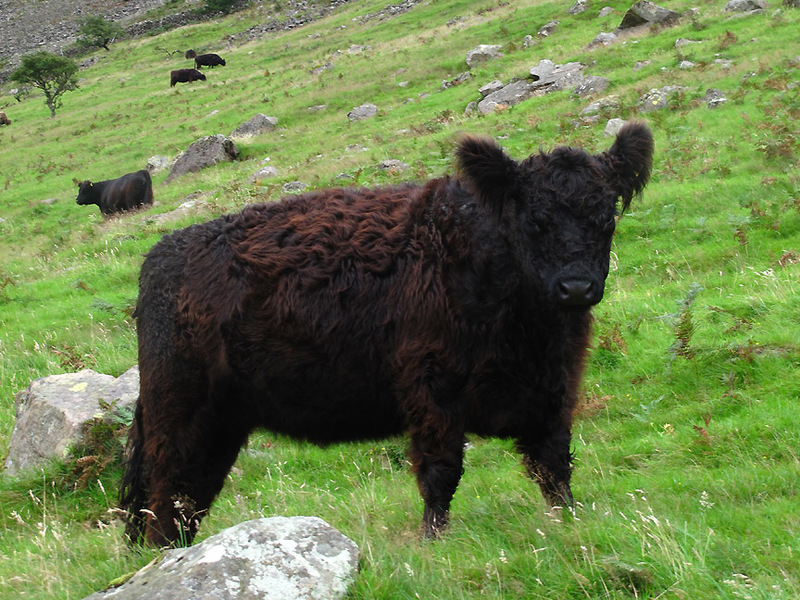 Stocky, delightful, docile Galloway cattle . . . they hardly blinked an eye at our passing. 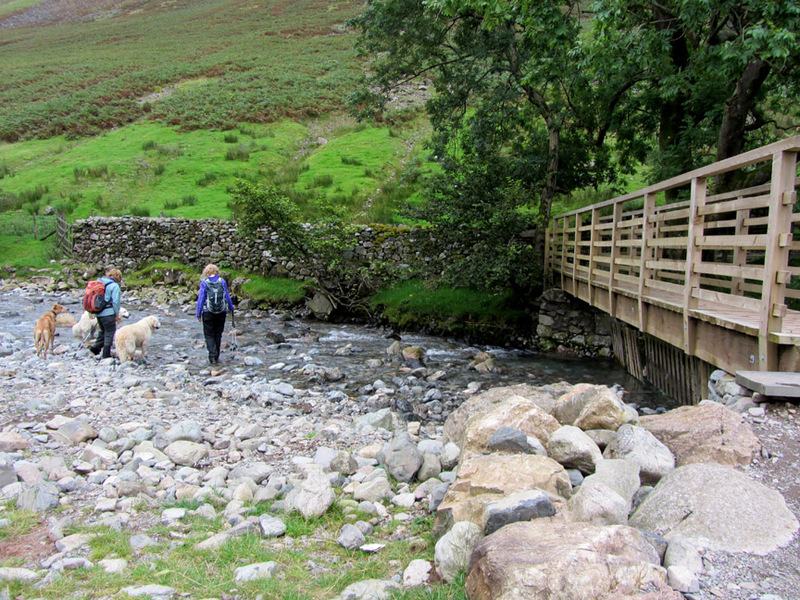 The bridge over Lingmell Beck, which now almost qualifies for river status due to its increased size. Maggie is first across followed by Amber. Ceremonial washing of boots it seems . . . removing some of the mud of the last section of path. 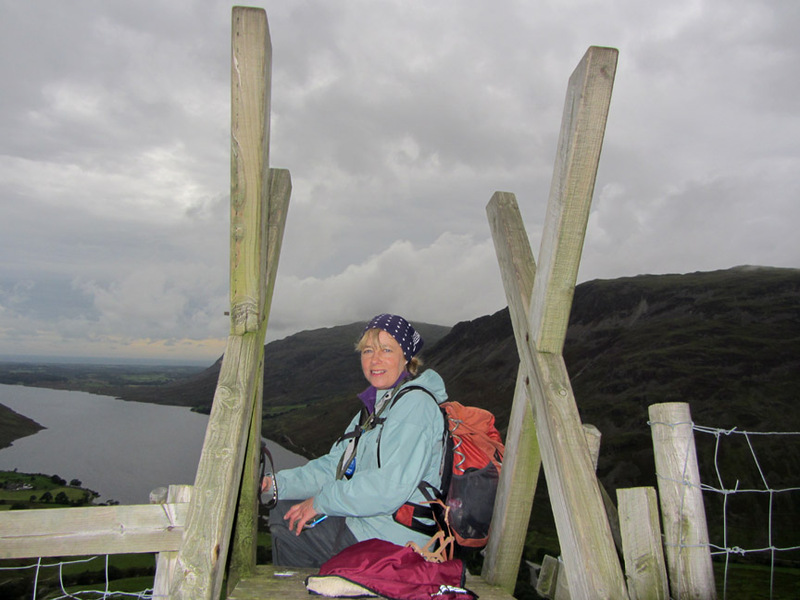 after a delightful walk following a circular tour of Lingmell Fell via the famous but less frequented Piers Gill path. 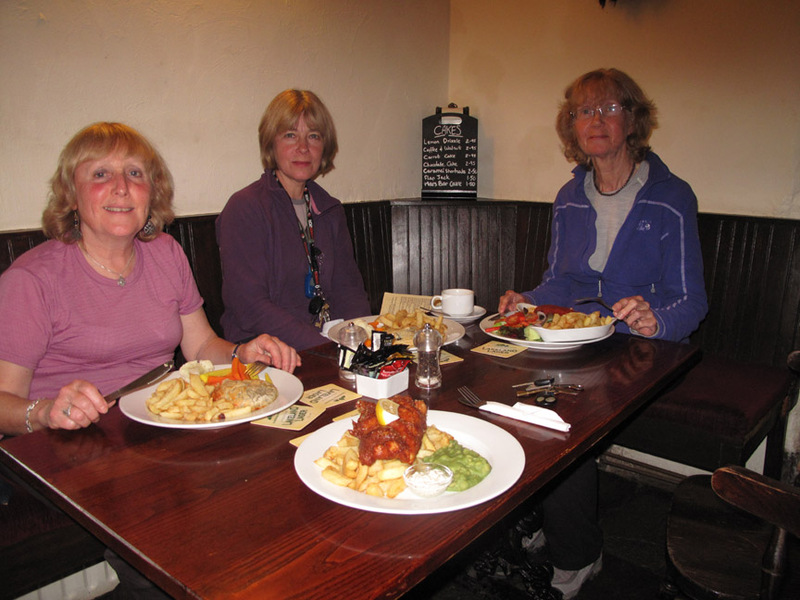 We adjourned to The Screes at Nether Wasdale where we enjoyed yet another fine supper to end the day. Technical note: Pictures taken with either Ann's Canon Sureshot SX220 or my Canon G10 digital cameras. This site best viewed with . . . the nicer aspects of poor weather. A previous time up here - 13th October 2006 A Great End to our "428 Wainwright Fells"